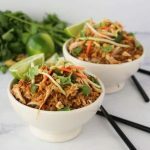 If you like Thai food, you’ll love these Instant Pot Thai Chicken Rice Bowls. The best thing about them is that since they’re made in the Instant Pot , they come together really fast and easy. 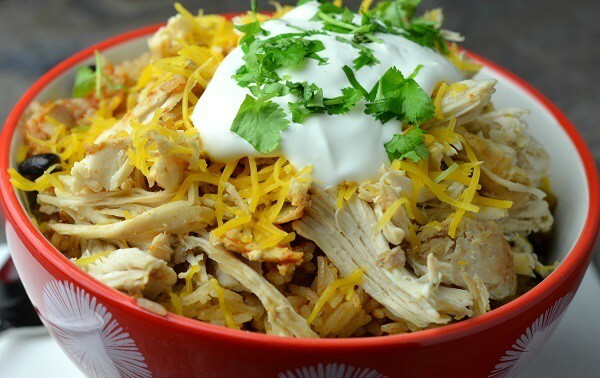 This Instant Pot chicken recipe is a fan favorite among my readers. I love Thai food and I’m a big fan of one-pot meals so these Instant Pot Thai Chicken Rice Bowls are one of my favorite recipes. My kids love it too, but I have to keep the spices down when I make it for the family. When I make a batch for my own lunches (this reheats great! ), I kick up the hot sauce and spices a few notches. Feel free to adjust the seasonings to suit your own preferences. One of the best features of the Instant Pot is that you can brown food in it so that you only have one dish to clean. We’re putting that saute function to use for this recipe. Sear it on both sides to seal in the moisture and give the breasts a nice brown coat. Next, you’ll create the secret sauce that makes this dish amazing. Combine all the ingredients in a liquid measuring cup. 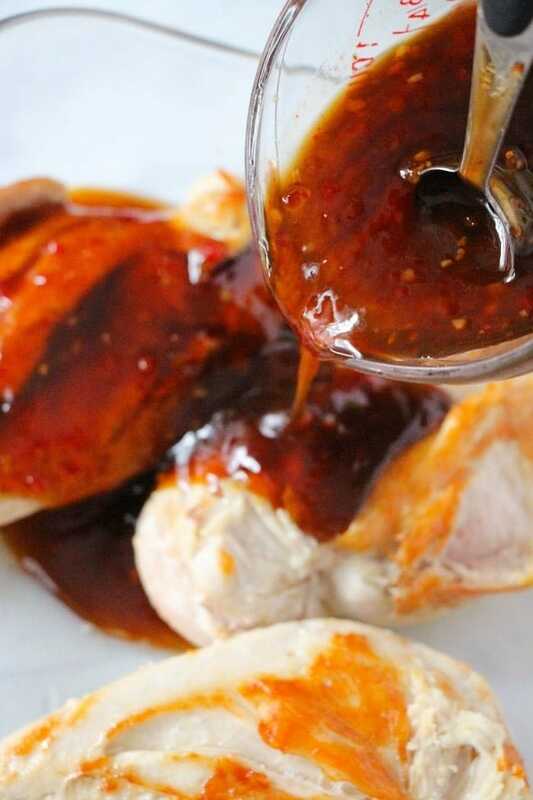 Then, place the chicken in a glass pan and pour the sauce over the top. Add the rice to the Instant Pot (I use a long-grain rice like jasmine or basmati). 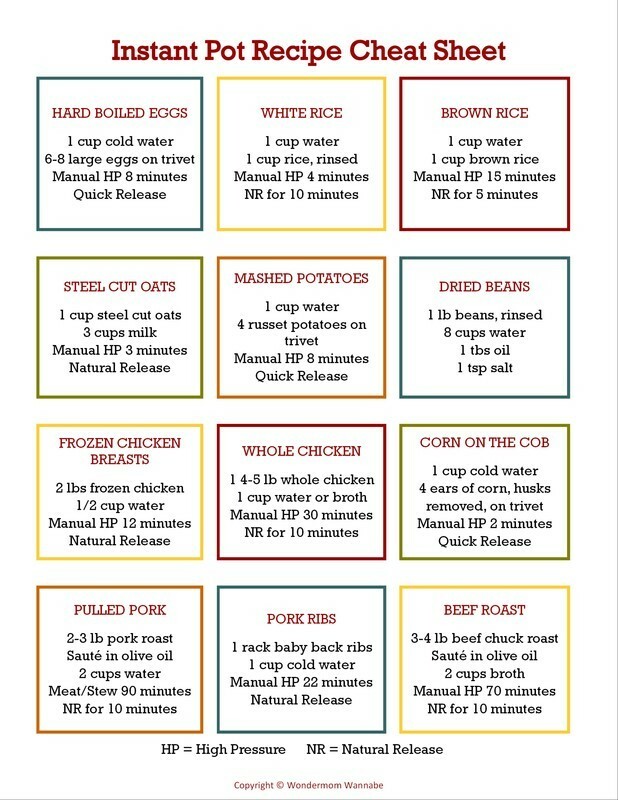 If you use a different type of rice, refer to this guide to adjust the liquid and cooking time. Overall cooking time will be similar so chicken will be fully cooked with any of the rice methods. Then add the chicken, including the marinade (just dump it out of the glass pan into the pot). Next, pour in the broth. 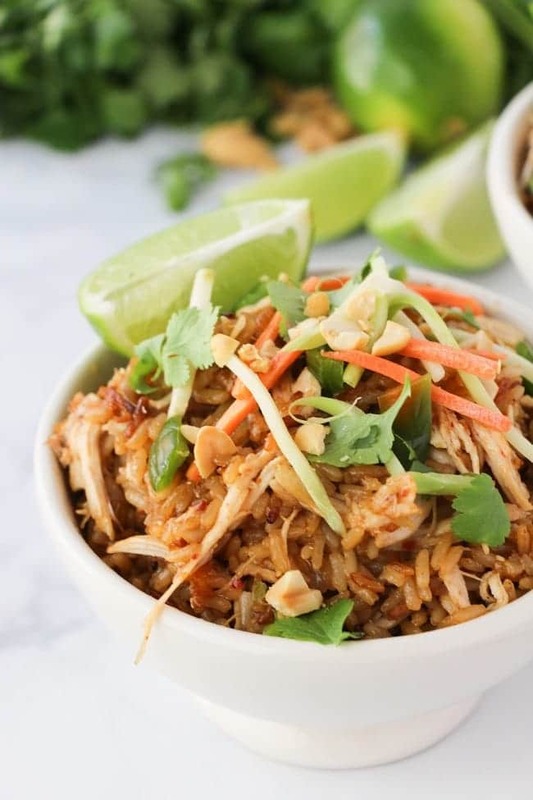 Ready to make these amazing Instant Pot Thai Chicken Rice Bowls? Here’s the recipe! IMPORTANT NOTE: The original recipe (and the way I make it in my own home) called for 3 cups of broth. After MANY comments from people who have tried the recipe reporting that the consistency was too mushy, I’ve reduced the amount to 2 cups. 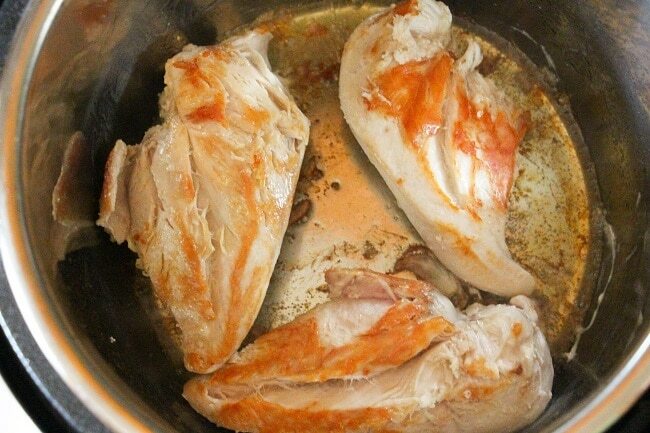 Sear the chicken breasts for 2-3 minutes on either side to seal in their juices. Remove to a glass baking dish (and turn off the instant pot). 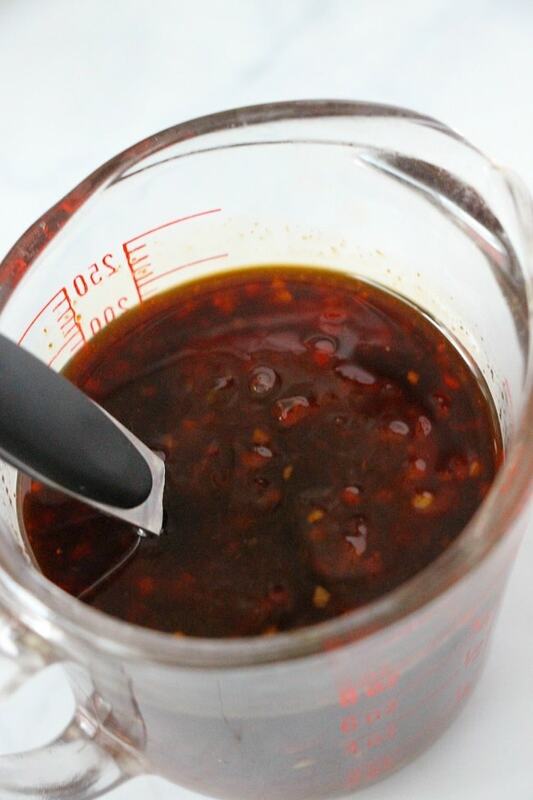 Mix the sweet chili Thai sauce, soy sauce, fish sauce, ginger, garlic, lime juice, sriracha (and peanut butter if you want to include it) together. 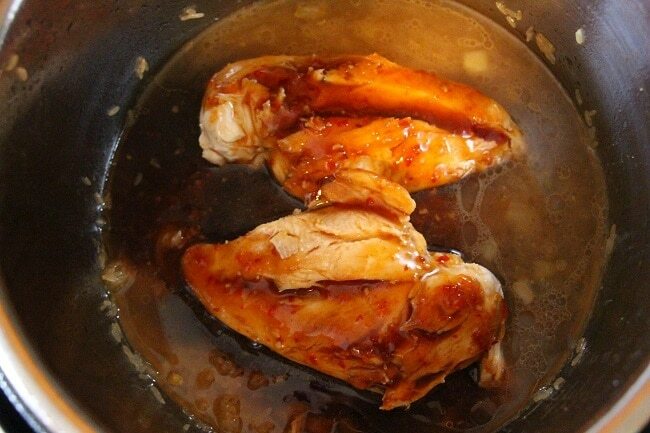 Pour the sauce over the chicken breasts and stir to combine. 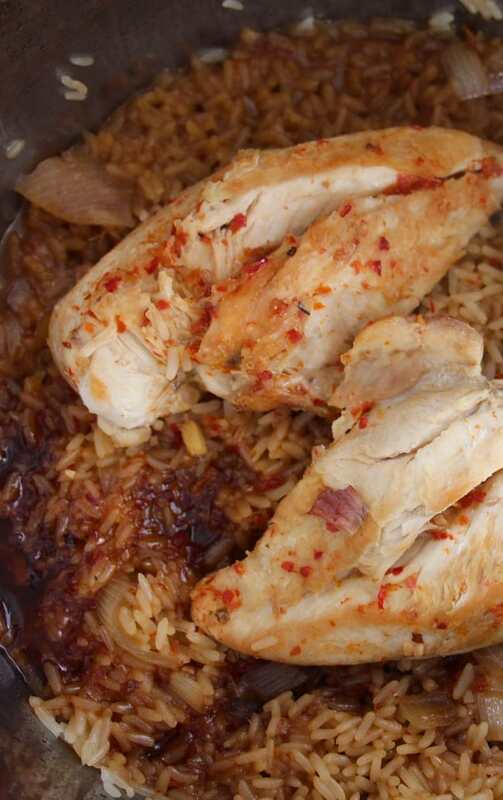 Place the rice in your Instant Pot and add the chicken and sauce over top. Select the manual pressure setting (high) and set the timer to 10 minutes. Natural release. 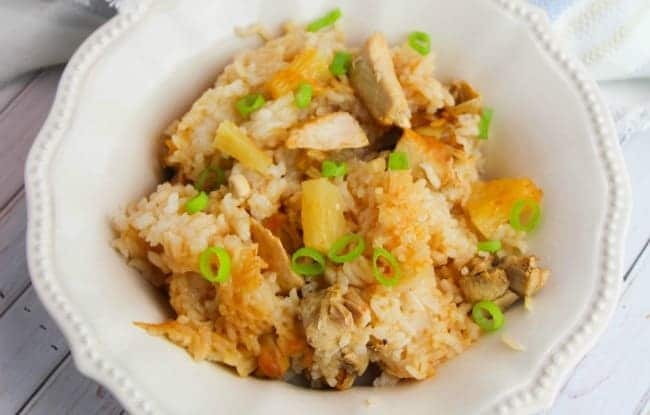 Shred the chicken with two forks and then mix with the rice before serving. Garnish with cilantro, shredded veggies and peanuts. Serve with extra soy sauce to taste. 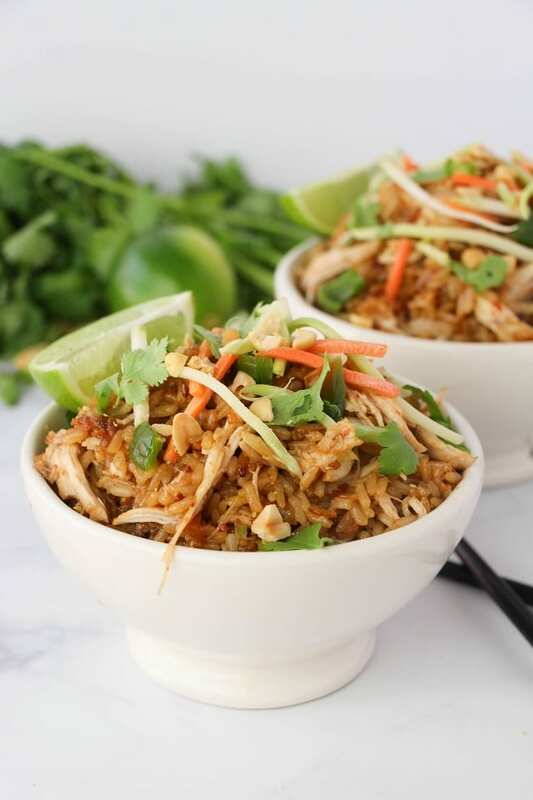 If you liked these Instant Pot Thai Chicken Rice Bowls, you might enjoy some of these other all-in-one Instant Pot rice bowl recipes. This looked so good and I followed your recipe exactly. No where in the recipe did it say to clean the pot after sauteeing the chicken. I would have sauteed the chicken in my cast iron. I also got the burn message. This has never happened to me. And I have been cooking in my instant pot for a while now. Guess it has to happen at least once. I am so disappointed. The sauce is delicious. But had to order in. I did some research and I guess things burn when there is high sugar in the recipe. Other than that I have no idea what I did wrong. This looks so good! This would be a good lunch meal prep! I love this recipe! I have made it probably 5 times now and every time it is great! So simple and yummy! Thanks! The sauce is delicious but only made it once because I got the burn message and had to finish it in the oven. How did you keep it from burning since you have made it 5 times???? Followed the recipe exactly for dinner tonight and it was soupy and ended up being too much liquid. It was a Thai rice soup. I tried hitting sauté to evaporate some of the liquid but the rice still ended up being coated in the thick sauce and it wasn’t tender as rice should be. It was not eatable. I would halve the chilli sauce. Maybe that could make a difference! Total mush. Followed recipe with 2 cups broth. Good flavor, rice was a disaster. I am making this recipe a second time because my husband and I liked it so much! Last time we steamed broccoli separately on the stovetop to incorporate as well. Is there a way I can cook the broccoli in the instant pot with the rest of the meal? Broccoli will be way overcooked if you add it with the other ingredients, but you can add it at the end and then return the lid to let it steam inside the pot on top of the other ingredients for a few minutes. I want to serve this with Coconut Rice….how much liquid should I leave out if that’s my plan? Hi Cam, I have never cooked coconut rice before so I hate to even guess. I’m sorry I don’t have a better answer for you! You have a good eye! My original version included a step where I sauteed onions after the chicken and before adding the rice to the pot, but based on the number of people who had burn issues, I deleted the step. There’s so much flavor from the other ingredients, I never missed the sauteed onions, plus the dish is easier to prepare. To answer your question though, if you want to add them, sautee them until translucent after you’ve browned the chicken and before adding the rice and other ingredients. His recipe was delicious! I did not get the bURN warning. 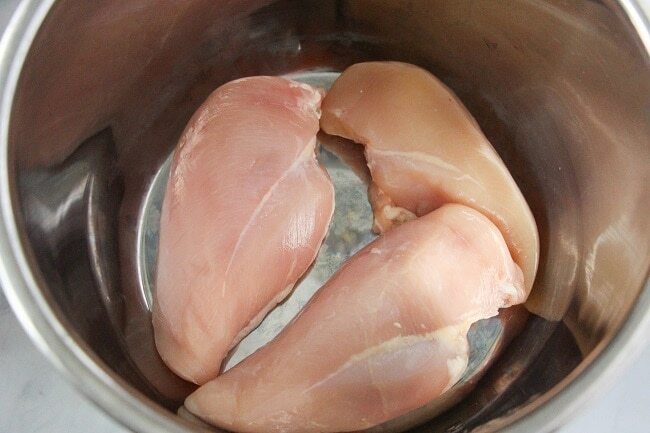 After browning chicken, you must clean out the bottom of pot thoroughly. If there is even a little bit of stuff in bottom of pot left from sautéing it browning, then you will get the burn warning. The only modification I made was using low sodium soy sauce and only using 2tbsp instead of 3. This was excellent and really fast. My rice came out a bit gloppy but I think it was one off two things. My sweet chili sauce was a bit watery so it could have been that or that I forgot to move the valve to pressure for several minutes so it may have been over cooked. Regardless, I will make it again. The crispy veggies add a great crunch. May try adding crunchy won ton’s as a topping too. My family LOVES the taste of this recipe. I wanted to add a couple notes on our experiences. -Remember that if you measure your rice with the measuring “cup” that comes with rice cookers (and I think even my instant pot came with one…I don’t know, somehow I have 3 of those clear plastic rice cups in my home..) make sure you measure your liquid/broth with those cups as well…because they are significantly smaller than standard size cups! Or use regular measuring cups for both the rice & liquid! -My family likes a higher rice to chicken ratio. (In my 8 qt instant pot), We double the rice, liquid, & sauce ingredients, but keep the chicken amounts the same. However, this makes it so it gets the burn code. I let it keep cooking, and usually by the time the Instant Pot actually turns off because of the burn code, everything is cooked through (though I usually use chicken thighs, so it may cook quicker than with breasts. If I do breasts, I will probably cut them so they aren’t very thick)…and we get a burned layer of rice at the bottom that we avoid until it’s time to wash the pot…lol. The recipe tastes SO GOOD, and we really want that extra rice, so I put up with this! – I borrowed the suggestion from another commenter about sautéing some stir-fry veggies in the pot, setting them aside, and adding them at the end. 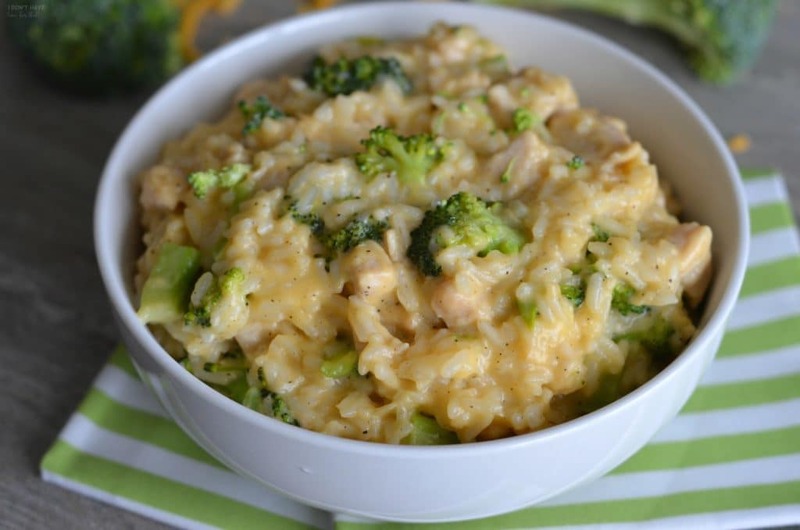 This is delicious & makes the meal feel healthier & more balanced to my family’s preferences. -The cole-slaw (shredded cabbage & carrot) bagged mixes make a great easy crunchy topping. We also like any other greens we have on hand…a bit of arugula or spinach. And we spice our individual servings up with Thai dry spice mix we keep on hand. This recipe sounds great but comes out as a flop! It burnt the bottom of the pot! It was a soupy mess too! Had to order in as everything was ruined! Something is definitely missing in this recipe! Hi Rachel, I’m sorry yours didn’t turn out. This is my most popular recipe and is many people’s favorite. I’m not sure went wrong with your batch, but I hate that your dinner was ruined. If you can give me more details (e.g. brands of the ingredients you used), it can guide me to add details to the recipe to help others avoid the same outcome. Burn burn burn! Followed the recipe exactly using 2 cups of broth in 8qt pot. When set to high pressure it started to burn the rice within minutes. We turned it off, moved the food, cleaned the pot of burnt stuff, added a lot more broth, and restarted. Another burn. We baked it in the end. Great flavors but something amiss.